George Hearst, graduate mining engineer, father of newspaper magnet William Randolph Hearst and great grandfather of Patty Hearst, joined the migration of gold seekers to California. He, along with many others, arrived too late. Unfortunately, his advanced education didn’t serve his wealth driven ambition in the Mother Lode country. That would change. 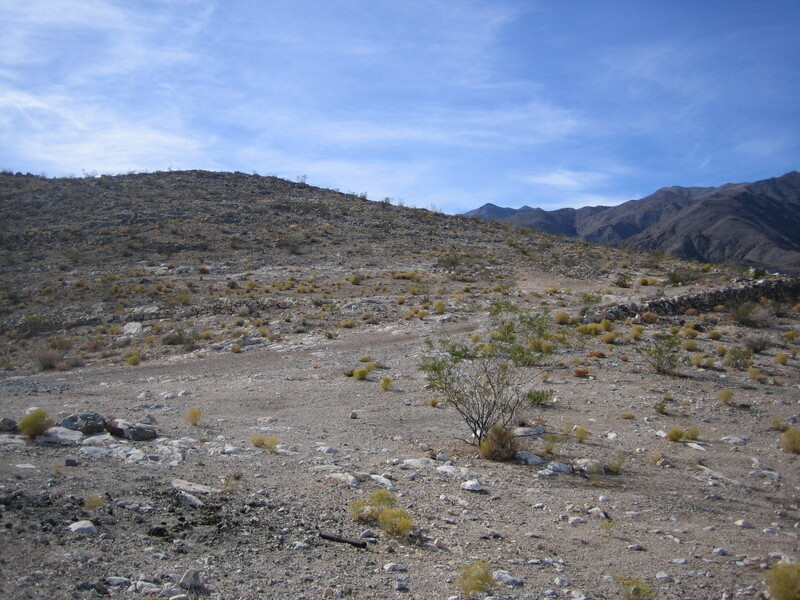 Hearst and a few other unfortunates decided to cross the Sierra Nevada Mountains in order to inspect a recently discovered silver lode in Nevada Territory. A sheepherder named Henry P “Old Pancake” Comstock discovered the lode which shares his name. Originally, it was prospected and claimed for gold. Later assays found it contain one of the largest silver deposits in the world. Hearst bought some claims, traded up and become very wealthy. It was said that he could size-up a good silver prospect and attract investors to those that showed promise. 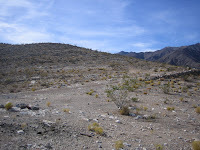 One such discovery occurred in early 1875 in the rugged Argus Range that forms the western edge of Panamint Valley. As this story goes, prospectors looking for the Lost Gun Sight deposit happened onto a marble ledge with exposed pockets containing the mineral galena that can host both silver and lead. It was perched near the top of a rounded finger that extended eastward from the Argus Range and was called both “Lookout” and “Modoc” (also spelled Modock). At the urgings of Hearst, the individual claims quietly fell into the hands of some wealthy San Francisco investors who formed the Modock Consolidated Mining Company and for his part, George Hearst respectfully became one of its directors. Ore from a number of tunnels and drifts drilled into the east and south faces of the mountain was brought by various means to the stamp mill and blast furnaces located on the top of Lookout Mountain. The two furnaces or smelters burned huge amounts of coke each day creating almost pure silver and lead bars. Placing the furnaces on top of the mountain rather than at its base was not a unanimous decision by the owners. 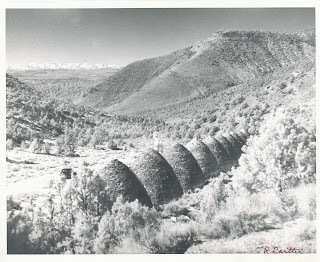 Conventional wisdom had it that, when possible, the stamps, furnace and other milling equipment best be located below the mines where gravity can help deliver the ore.
Across the Panamint Valley in Wildrose Canyon, ten beehive shaped kilns reduced local pinion logs to ninety-five percent pure carbon by burning them slowly in a limited amount of oxygen – a process that took weeks. The furnaces’ inexhaustible appetite for fuel placed a heavy demand on the kilns. Crews of sawyers worked all across the Panamint Range cutting pinion trees and hauling the logs by pack train to the kilns. In addition to cutters and haulers, the operation needed a sizable crew to operate the ovens. This frenzy of activity brought some additional enterprise to the canyon in the form of a general store, a boardinghouse and a number of saloons and shops. John Small and Archie McDonald, two inept “road agents”, arrived in the Wildrose Camp after two unsuccessful stagecoach robberies conducted on the road leading out of Eureka, Nevada. In both cases, the safe-box happened to be empty -- they had picked the wrong stage both times. Well Fargo sent out notices offering a reward of $500 for their capture. Incredibly, a short time after the notices were sent word came back to the Eureka Sheriff’s Office that John and Archie intended a return to Eureka and attempt another holdup. This time, the company set a trap for them by placing a guard inside the coach rather than on the seat next to the driver. Once again, the pair followed an eastbound stage and stopped it at gunpoint a few miles out of town. The driver pitched the safe-box down as ordered and as Archie greedily reached to un-strap the top flap on the safe-box, the guard jumped from the coach wildly firing his shotgun. The boys narrowly escaped capture on that day and promptly headed back to Wildrose Canyon and their mining claims. Later that year, their career took a favorable turn when they stopped a Panamint City stage. This time the safe-box contained $2,000 -- considered a good haul back then. Lookout was served by three saloons, a few stores a boardinghouse, a meeting hall, and a post office plus regular stage service to Darwin. The population may have reach 200. Oliver Roberts, owner of one of the saloons and sometimes constable, wrote about enforcing the law without benefit of a jail or Justice-of-the-peace. According to his account, those being held for some misbehavior were chained to a post until someone could be talked into hauling them to the Darwin jail - a rough 15 miles away . When a Methodist preacher came to town it raised some questions about the future of Lookout among superstitious miners. Denny Murphy came in to Roberts’ saloon to warn everyone that preachers and women in camp were as bad as a miner whistling underground. Murphy told Oliver that he better sell before it’s too late and go someplace else. According to the story, Roberts took Murphy’s advice and immediately placed a sign out front -- “Saloon for Sale “. The Minnietta mine took form on the south face of Lookout Mountain above Thompson Canyon. The ore bodies were located in a southerly extension of the marble ledges being mined by the Modock Company. Though located in the 1870s, little was recorded about the workings of or production from the original claims. In 1898, Jack Gunn bought the claims and increased production of both silver and gold. Moderately rich ore mined from off-shoots of an incline shaft was shipped to San Francisco for processing. The mine was closed after World War I and reopened in 1944 principally for the production of lead. It is also now idle. The old photo on the left shows Lookout circa 1900. My recent retake from the same camera location shows that only foundation rubble and a rock walled structure remain. The town site is located at Google Earth 36 14.726; 117 25.986. There’s a rough access road on the northside of the mountain in Stone Canyon. About a mile short of the top the road becomes impassable (at least for me). High clearance vehicles can probably make it to that point. From there it is an easy hike to Lookout. The Minnietta camp features a restored cabin plus a number of foundations, tunnels, shafts and other interesting remains. The cabin is an example of building restorations being carried on in this part of the California Desert by volunteers under the direction of the Bureau of Land Management. 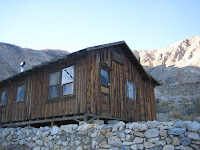 The cabin is open to the public. The camp is located at Google Earth 36 14.250; 117 25.745. The road (rough in spots) up Thompson Canyon ends at the cabin. The three black and white photographs above (beehive kilns, Lookout town site and Minnietta Mine) provided courtesy of the County of Inyo, Eastern California Museum.